We know what your sweet diva wants! Our Dog Dresses are simply some of the finest dog outfits around. We feature doggie dresses you and your pup will delight in showing off! With so many dog dresses to choose from, we know the \"perfect doggie dress\" decision may be difficult, but of course, you can always consult with our pawsonal shopper service! Dress your darling up in this beautiful pink and chocolate brown dog dress. This dress is ..
Lots of lace together with Pink Satin! The two tone lace trim adds to the uniqueness of this spec..
Birthday Girl Doggy Dress! Bling for your princess! Available in Red or Pink Skirt. .. Your precious pup will be the princess of the day in this black petty dog dress with a sparkling cro..
Gorgeous Black Velvet & Purple Satin Dress! It even comes with a matching leash! Si.. SO CUTE! 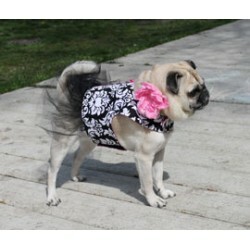 Beautiful dog dress, black top with hot pink chiffon ruffles and your choice of crystal .. The Ruff Ruff Couture® Carmen dress is perfect for the good little girl who likes to take a walk..
Classic American Doggy Dress! For your patriotic princess! *The skirt comes in red or pink. .. This party dress is simply beautiful, and it will make your chic doggy the belle of the ball! It is .. Your chic doggy will be the hit of the party in this beautiful party dress for dogsl. It i.. Perfect for a birthday or any occasion. This hot pink petti dog dress is made of stretchy, bre.. Your little girl will look adorable in this hot pink ruffle heart on pink petti dog dress. This dres.. It's My Birthday Dog Dress! Pink cotton dress with a cute cupcake print ribbon trim..
Adorable Dress Available in 3 Colors! Made with Super soft 100% cotton!!! This dress is made with ve..
Leilani Dress for Dogs - available in 3 colors! So adorable with exquisite detailing! This dress ismade with Super Soft 100% cotton, velcro closures.. Your dog will be stylish and the envy of all around in this brown leopard ruffle petti dog dress. Th..
Little Black Dog Dress by Ruff Ruff Couture® - beautiful & sophisticated! Any fashion conscious dog needs this fancy dress. It is made of beautiful black sateen and has pear..